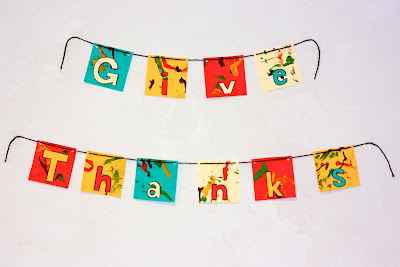 I've been seeing a lot of beautiful Thanksgiving buntings lately on the craft blogs I follow, and I decided that I wanted to make one for myself. This bunting is great for kids of all ages. Older kids can help cut out the pieces and measure the yarn, younger kids can help punch holes for the yarn or draw the letters for you to cut out, and the youngest ones can contribute their own artistic skills as demonstrated below by Jude. I began by sketching out in a notebook the order that I wanted to colors to be in-- both the background squares and the letters. Then, I listed what I needed by color so I wouldn't forget anything. If I want something to go smoothly, I have to be extra organized like that because I tend to be a bit forgetful. 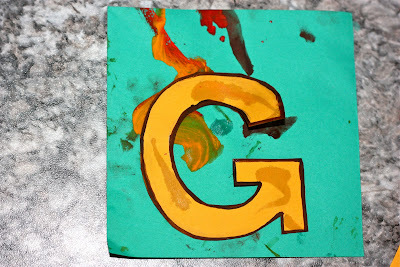 He (less than enthusiastically) obliged, and while that was drying, I sketched and cut out the letters, and painted a thin brown line around the edges of each letter. When everything was dry, I set about putting it all together. 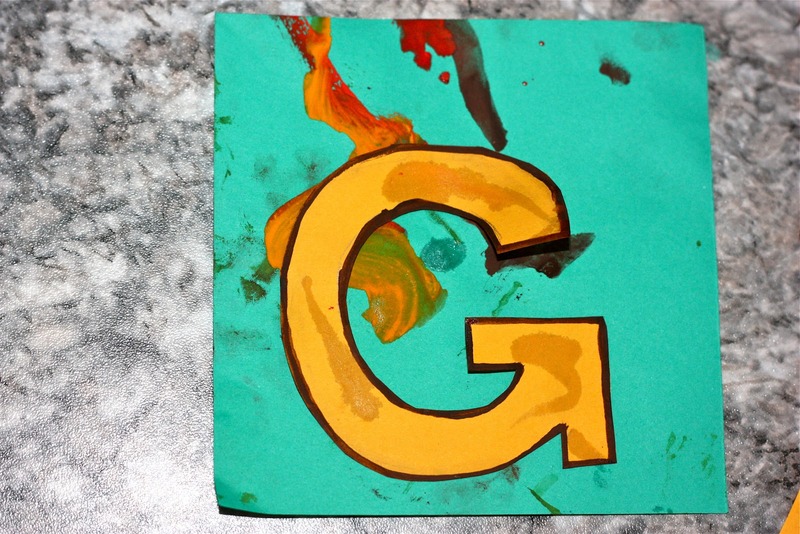 Fortunately, the G was the only one I super glued before realizing that it was a bad idea. I went for tape. 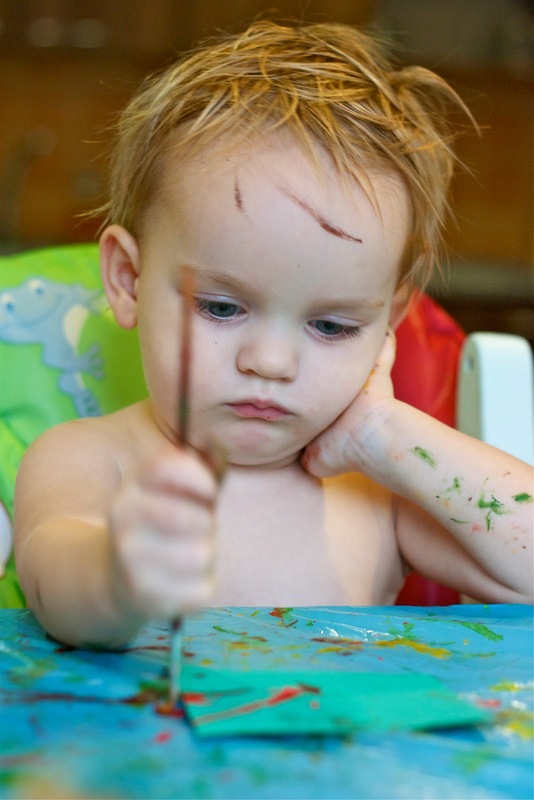 If you have normal craft glue, that might be your best option. But I dunno... it might show through the letters too. Tape, rolled into tiny tubes, worked great. Then, I went upstairs and got my husband's hole puncher from his office. I punched holes in the top corners of all of the squares, threaded some dark brown yarn through, and hung it proudly. I'm not thrilled with hanging it on the wall with tape, but this isn't my house, so I couldn't put holes in the wall. I wanted the banner to be near the dining table, and this was the best place for it. 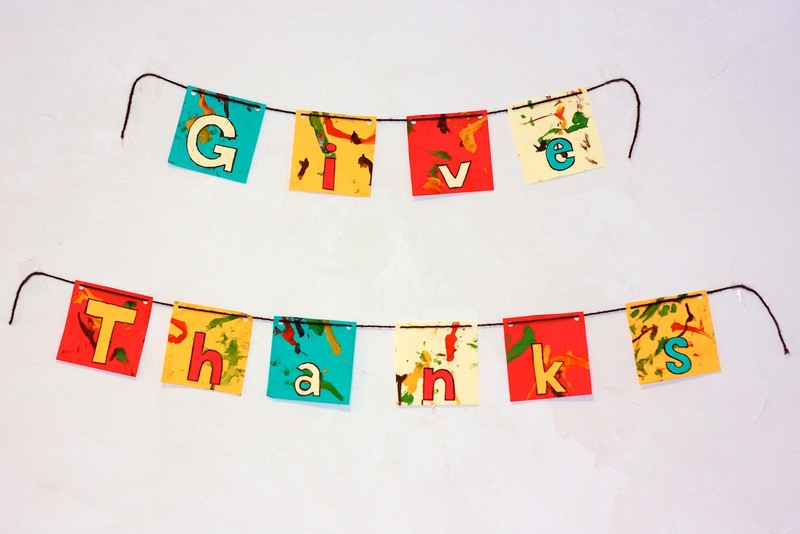 So there you have it, an easy Thanksgiving bunting that kids of all ages can enjoy helping create! ETA: I added this tutorial to the link parties on Today's Creative Blog's and Pinkapotamus... you can see all of the fun Thanksgiving tutorials here, and here.